They reflect light evenly diffusing it into the space with wide viewing angle. The Gain of the diffusion surfaces is very close to 1. The pro- jector installation method (ceiling, table, with optical angle shift) do not change the quality of the picture displayed at the diffusive surface. Matt White, Matt Grey, White Ice fabrics and White Glass panel are diffusion projection surfaces. They reflect light directionally into the space similar as mirror. Such re- flection characteristics offers higher picture brightness when observed from the direction the light is reflected to, but the viewing angle is limited. Typical Gain values of reflective surfaces are from the range between 1,5 and 3,0. Projection systems with reflective surfaces re- quireesxact positioning of projector, screen and audience. Silver P fab- rics reflective projection surface. They reflect light directionally back to the light source. High picture brightness will be observed from the right direction or the very nar- row viewing angle. Typical Gain values of retro-reflective surfaces are from 2,0 to 2,5. 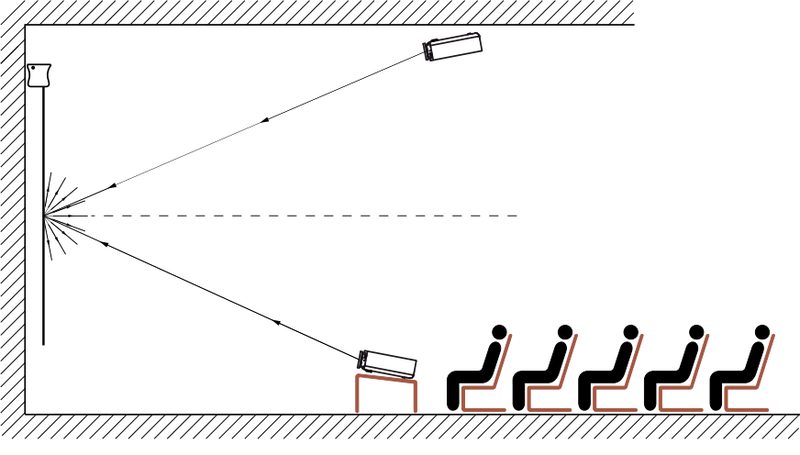 Projection systems with retro-reflective surfaces re- quires projector and audience to be located at the same level and di- rection. Glass Beaded projection fabrics are retro-reflective surfaces. They transmit and diffuse light into the space. High picture brightness is guaranteed at limited viewing angle only. Typi- cal Gain values of diffusion-reflective surfaces are from the range 2,5 to 4.0. 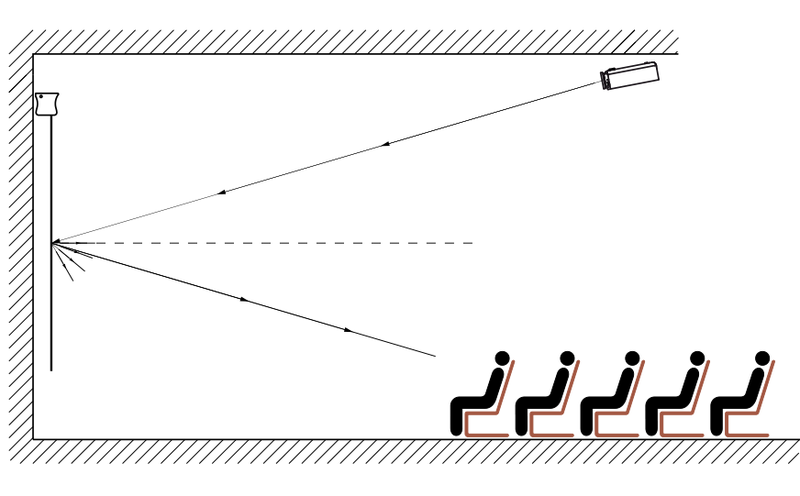 Projection systems with diffusion-reflective surfaces requires precise positioning of projector, screen and audience due to very narrow surface viewing angle. Rear pro- jection fabrics New Coral and Rear projection panels Grey Glass are Diffusion-reflective surfaces. Projection screens should have black borders. It is not just a decorative element, but it improves perception of the projected picture quality. The black border sep-a rates optically the picture from the background and limits viewers attention to the displayed content. The projected picture surrounded with black bordering is recog- nized as brighter and higher contrast than picture projected at the same surface but without black borders. On top of that the black borders moves the projected image away from the fabrics edges, so any surface flatness imperfections happening at the fabrics side edges will not affect the image quality. Additional black belt over the picture area is required to lower the position of the picture area, so it’s bottom edge would be at the ergonomic height. 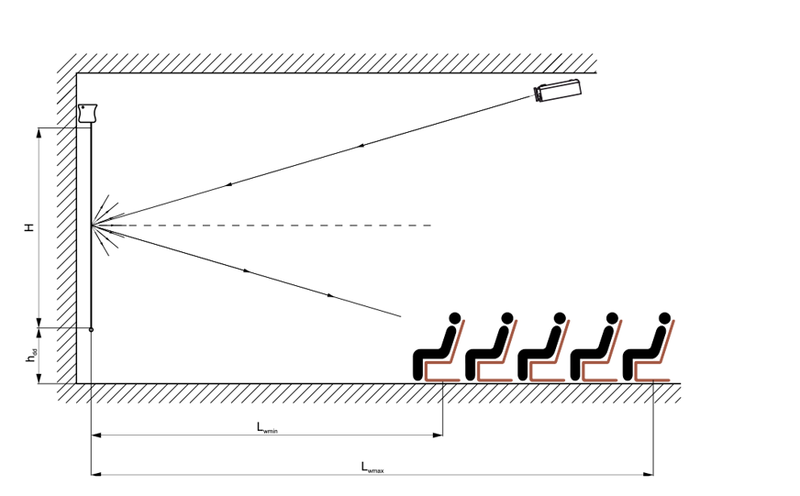 Additional advantage of the wide top border is reduction of light reflected from the screen to the ceiling and increasing ambient light level at the area. Picture projection is a picture phenomenon, it seems to be very easy and non prob- lematic. The picture is a result of reflection of the light from the projector and envi- ronment light at the surface of the projection screen. The projection fabrics is the main and most important screen component. Type of projection surface and it’s optical parameters decides about the picture quality and presentation. Fabrics char- acteristics are described with the following parameters: Gain and viewing angle. Relative reflection coeffcient called Gain, describes the amount of light reflected by the surface related to the amount of light reflected by the standard surface. Stand- ard surface is covered either with either magnesium carbonate (MgCO3) either ti- tanium dioxide (TiO2). Both chemical substances are white and they reflect light lossless. Standard fabrics gain is 1. 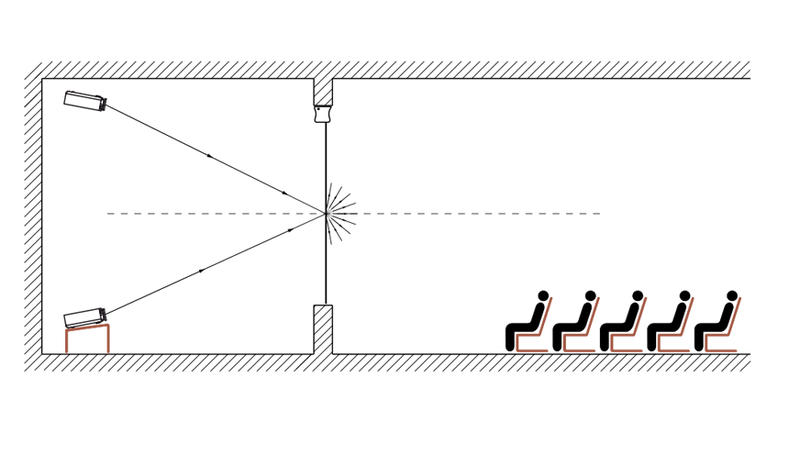 Viewing angle describes the maximum angle the projected picture could be ob- served without quality decrease. The picture brightness is higher when observed perpendicularly to the surface and decreases with the increase of the viewing angle. The angle, observed picture brightness decreases to 50% of the maximum value is declared as fabrics Viewing Angle. There is close relation between the Viewing angle and Gain parameters. The surfaces with large Gain has Viewing Angle smaller then surfaces with small Gain. Depending on the light reflection characteristics there are the following pro- jection surfaces: diffusion, reflective, retro-reflective and diffusion-reflective. Portable projection screens are recommended if you plan to project pictures at dif- ferent places and in different conditions. In case of fixed screen installation the selection of electric, manually operated or fixed frame screen depends on the user’s individual preferences and planned budget. Projection devices display the images of the width to height ratio determined by the unit construction. It is called picture aspect ratio. 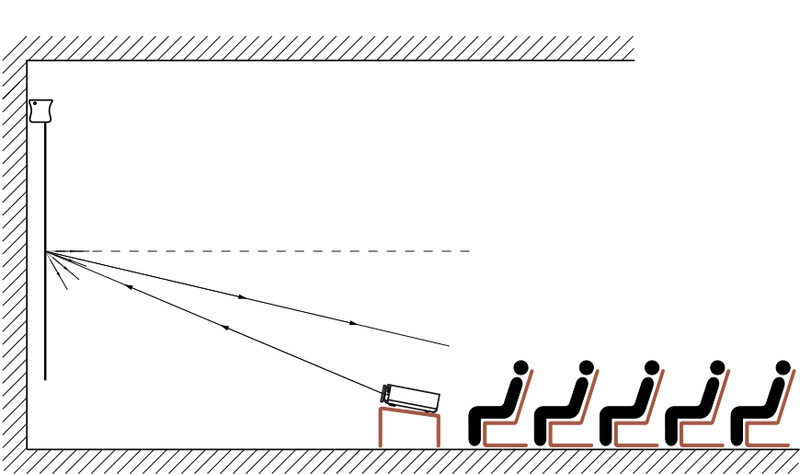 Projection screen viewing area should have the same aspect ratio as the projection device used in the system. This will guarantee optimal projection performance. The screen should be installed at the ergonomic height, so the viewers could watch the displayed images comfortably. Premises size, projector brightness, ambient light conditions should be kept in mind when calculating the screen size. Avers projection screens are designed for wall or ceiling installation. We have in- vented unique installation system to simplify the screen installation. Any of the in- stallation systems elements is no visible after the screen installation. There is only 1 mm distance between the screen cassette and the ceiling , so the screen seems to be glued to the ceiling. The installation rails integrated with the screen cassette, ceiling bracket and the locking bolt are the 3 elements of the system. Installation of the screens up to 3,5 meter in the base requires: to drill just 2 holes in the ceiling, fix the brackets with 2 anchors, slide the screen rail at the bracket hinges, turn the screen at the position and secure it with the locking bolts. It is possible to fine tune the installed screen position horizontally in case it occurs after installation the pic- ture is not displayed at the central position. Screens dedicated for the in-ceiling installation at the recessed ceilings have dedi- cated modular design. There are 2 methods of screen installation depending on the recessed ceiling structure, screen surface is protected from dirt and damage during installation, inspections and maintenance of the installed screen are secured with the screen structure. The screen module and ceiling module remain hidden behind the masking module when the screen is installed. Disassembly of the masking mod- ule can be done by single person. It provides full access to all components of the screen behind.